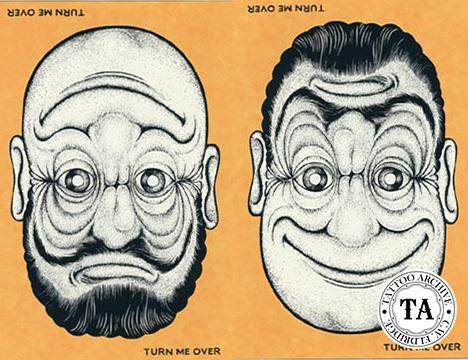 The origins of designs used in the art of tattooing have always been of interest to the Archive. Tattooists today, as in the past, borrowed freely from other tattooists and any other image source available. Newspapers, magazines, paintings, film, comics, posters you name it! If the image was in public access it was employed to the tattooist's advantage. This article will focus on those strange little designs, that for the lack of a better term, we shall call "upside-down" designs. When they are viewed upside-down they form a different, often x-rated, picture. These images gained much popularity in the tattoo world during the 1930s and 1940s, often showing up on flash sheets and the backs of business cards. 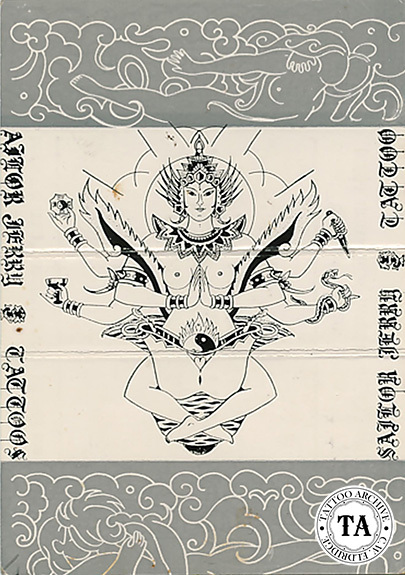 The upside-down girl is often seen on sheets of flash. Christian Warlich of Hamburg, Germany devoted almost an entire sheet to these designs. 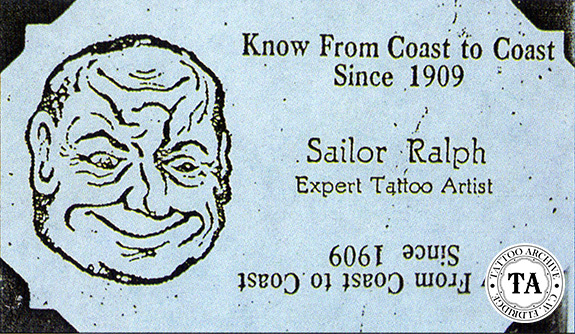 There were upside-down designs that tattooists used on their business cards and others used heads of popular cartoon characters . One of the most popular was the head of a man that when viewed in one direction would be smiling and when turned over was frowning. 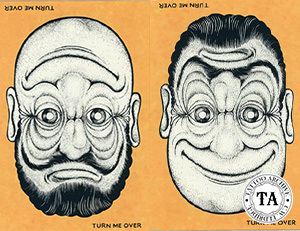 In the 1960s Pinky Yun used an unusual folding business card that when folded and turned upside-down formed an image of two people fornicating. Tattooists thought that with these joke images on their cards people were more likely to hold onto their cards and show them to their friends.